The scalable South Carolina map on this page shows the state's major roads and highways as well as its counties and cities, including Columbia, the state capital and most populous city. To display the map in full-screen mode, click or touch the full screen button. To zoom in on the South Carolina state road map, click or touch the plus (+) button; to zoom out, click or touch the minus (-) button. To scroll or pan the zoomed-in map, either (1) use the scroll bars or (2) simply swipe or drag the map in any direction. (The scrolling or panning method you use will depend on your device and browser capabilities.) At any time, you can display the entire South Carolina road map in a new window or print this page, including the visible portion of the map. South Carolina's Interstate Highways connect its major cities and facilitate travel between South Carolina and its neighbors. I-20 traverses central South Carolina from east to west, beginning at I-95 near Florence and leaving the state at the Georgia border. I-26 runs from the southeast coast at Charleston to the northwest. I-85 traverses northwestern South Carolina, and I-95 crosses the state from northeast to southwest. The state's auxiliary Interstate Highways serve some of its metropolitan areas. I-126 provides access to downtown Columbia from I-26. I-185 serves Greenville's southern suburbs, while I-385 links I-85 near Greenville with I-26 near Clinton. I-526 provides access from I-26 to outlying areas of Charleston and its suburbs. I-585 is a short feeder highway north of Spartanburg near I-85. The Cherokee Foothills Scenic Highway climbs the slopes of the Blue Ridge Foothills in a 130-mile drive across the northern border of the state. Caesars Head State Park showcases a spectacular panorama of the foothills from its 1,200-foot overlook and is home for more than 50 waterfalls. Table Rock State Park offers many challenging hiking trails, and the Route 107 Scenic Byway winds through the beautiful Sumter National Forest. 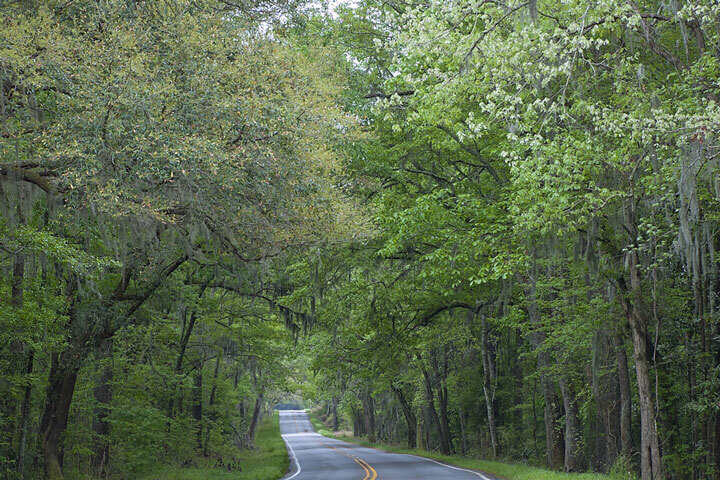 More information about scenic roads in South Carolina is available on these America's Byways: South Carolina and South Carolina Drives pages. For more information about South Carolina's roads and transportation infrastructure, visit the South Carolina Department of Transportation website. For South Carolina road traffic conditions, visit the Federal Highway Administration's South Carolina Traffic Information page. South-Carolina-Map.org is a State Maps reference source.